Architectural metalwork railings and staircases are just one area of our speciality. 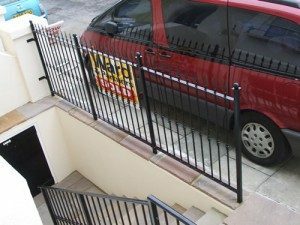 Working with domestic and commercial clients across Kent and London, we fit reliable, attractive and durable railings and staircases to suit any requirements or specifications. We manufacture our metal railings and staircases from pre-galvanised steel for reliable strength and weather protection, no matter where they are situated. To ensure absolute safety and reliability, we ensure that all fabrications of metalwork, including railings and staircases, meets our incredibly high standards of quality. From simple piped railings for construction sites or industrial factories to bespoke designed railings and metal fencing to fit around difficult spaces or fulfil very specific requirements. We bespoke design and customise standard designs to provide you with a steel railing that you want and require. Finished in a range of colours for high visibility or to match company branding, we paint, powder coat or prime to perfectly complement your property’s style and décor. We often work with developers, creating batches of metal balcony railings to go onto a new block of flats. Sometimes purely functional, but often a decorative aspect of the building exterior, we provide a bespoke design service to architects and designers who want to add a unique touch to their latest building project. Our in-house design and fabrication team utilise the latest in CAD technology to bespoke design and fabricate a perfect staircase for your requirements. Simple and straight or curved and ornate, our team have the experience to turn even the most basic ideas into a fully functional, high quality reality. Whatever your railing or staircase requirements, we will provide a cost effective and attractive solution that adds an additional feature to your domestic or commercial property.